RAPID CITY, S.D. (Nov. 7, 2017) – James (Jim) Rankin, the chief research officer and professor of electrical engineering at the University of Arkansas, will return to his alma mater as the 19th president of South Dakota School of Mines & Technology, the South Dakota Board of Regents announced Tuesday. Rankin, a South Dakota native from Draper and Fort Pierre, graduated from SD Mines in 1978 with a bachelor of science degree in electrical engineering. He becomes president at the Rapid City campus Jan. 8, 2018. He succeeds Jan A. Puszynski (YAWN push-IN’-skee), who served in an interim capacity this year as president after Heather Wilson left the university to become United States Air Force Secretary. Puszynski will continue in his position as Mines’ vice president of research. 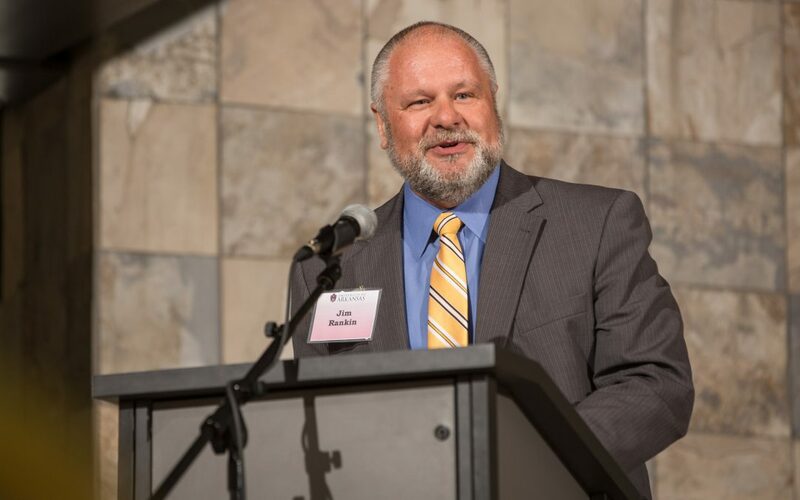 Under Rankin’s leadership as vice-provost for research and economic development, the University of Arkansas has generated more than 50 start-up companies and significantly increased annual external funding to $103 million. He led efforts to develop the institution’s first strategic plan in research and economic development, instituted several faculty recognition programs, and developed an expedited industry contracting process. “I am very honored to be returning to SD Mines as its 19th president. I know firsthand the excellent academic preparation that students receive here,” Rankin said. “A 98 percent placement rate for 10 straight years is a testament to the quality education provided by the outstanding Mines’ faculty. There will be a continued emphasis on the success of our students. Rankin’s spouse, Wendy, holds a Ph.D. in counselor education from Ohio University and is active in student engagement and philanthropy. They have three adult children, Kara, Anna, and Daniel. Kara, a doctor of physical therapy, and her husband, Caleb, live in North Carolina. Anna, an assistant professor at Ohio University, and her husband, A.J., live in Ohio. Daniel is an aeronautical engineer working in industry in Los Angeles. The Rankins have two grandchildren. In addition to family and travel, Rankin has numerous interests including aviation. He holds multiple pilot licenses and ratings, and is a member of the Board of Trustees for the American Institute of Aeronautics and Astronautics (AIAA). His current research area is on avionics requirements for on-demand mobility (flying cars). The South Dakota School of Mines & Technology is committed to excellence in science and engineering academics and research, and to developing the next generation of leaders and problem solvers. It was founded in 1885 to provide instruction in the region’s primary industry, mining, and has evolved into one of the leading science and engineering universities in the region. SD Mines serves as a conduit for the development of new technologies and world-class research. The innovation and ideas that flourish at Mines translate to new businesses and high-paying jobs in South Dakota and beyond. The university is governed as part of a system of public higher education by the South Dakota Board of Regents, which is composed of members appointed by the governor for six-year terms and one student regent appointed for a limited term.